John just moved into his new house and is excited to set up his new home theater and wifi. He schedules cable and internet to be installed on Friday between 10am and 2pm, and makes arrangements with his employer to be home to meet the technician. By 2:30pm on Friday, no one has shown up yet, so John calls his customer service agent to see why there’s such a delay. He then learns that he’s missed his appointment! When the technician attempted to call him at 9am to confirm his address, he ignored the out-of-state number that came up on his phone, assuming it was junk. Frustrated, John reschedules his appointment, although the relationship with his new service provider is already tarnished with a negative experience. Even with legitimate calls, the calling name and number are often not accurately displayed, or there is no name displayed at all. With the massive increase in unwanted robocalls and caller fraud, consumers are reluctant to answer their phone if they can’t be certain who is on the other end of the call. 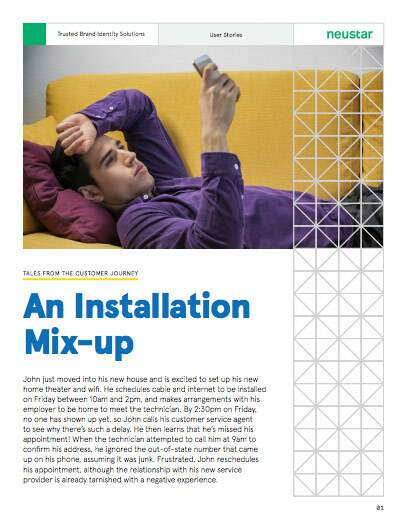 Your customers fear wasting their time or worse, getting scammed, but they also report regret in not picking up a call that turned out to be important, such as confirmation of an installation. Installation is a key stage of the customer experience journey – it’s your chance to kick-start your relationship with the customer and set them on a path to trusting your brand and buying more services from you in the future. Because today’s consumers have become accustomed to the self-setup of many digital services, they already see an in-home appointment as an inconvenience. As a costly business expense, you want to make it as efficient as possible. A missed appointment results in not only an unhappy customer, but another truck roll, more gas, and one more delivery to schedule.